Celebrity offspring: It's baby news galore! Celebrity offspring: It’s baby news galore! 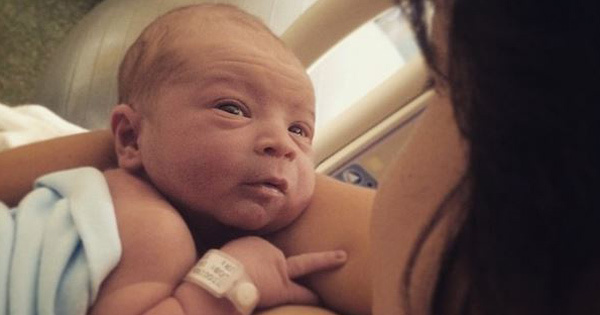 We’re only 10 days into the year, but 2015 has already brought a celebrity baby boom. Can’t keep up? Here’s our rundown on new arrivals, announcements and first baby pictures. Australian singer-songwriter Missy Higgins announced the birth of her son with partner Dan Lee via an Instagram post with a truly sweet photo (at the top of this post) on Monday. “Our little boy Samuel Arrow Lee arrived yesterday. Not sure how we managed it but he seems perfect. And we’re besotted! Let the adventures begin,” the post says. The next day, the internet went into a frenzy after it was revealed Gossip Girl star Blake Lively and husband Ryan Reynolds had welcomed their first baby, a daughter. No official word yet on her name, though there have been whispers that it is Violet. Actress Zoe Saldana, 36, gave birth to twin boys – Cy Aridio and Bowie Ezio Perego-Saldana – late last year but only made it public last Sunday. “Mother and sons are happy and healthy,” a statement to US Weekly says. Singer Alicia Keys and Swiss Beatz also welcomed a son, Genesis Ali Dean, just before the New Year. “The joy of joy is joy!! It’s a boy!! We are so grateful! !” Keys, 33, writes on Instagram. The Voice Australia winner Karise Eden gave birth to her first child, a boy called Blayden, on Christmas Eve. Actor Benedict Cumberbatch and partner Sophie Hunter are expecting their first baby, revealing their big news two months after announcing their engagement. It should be a huge year for Sherlock actor, 38, who is a frontrunner for the best actor gong at the Golden Globes, says The Guardian. Actress Jennifer Love-Hewitt also revealed this week that she and husband Brian Hallisay are expecting their second child. Speaking of anticipation, after a few months of being well covered by The Project‘s desk, Carrie Bickmore finally gave us a glimpse at her baby bump in the Instagram post below. Model Nicole Trunfio also gave Instagram a good look at her almost-done baby bump – working out at 38 weeks pregnant. We’ve also waited a long time for these photos – the first pictures of Mila Kunis and Ashton Kutcher’s baby, Wyatt. She’s been kept out of the public eye for three months, but her mum posted a couple of photos to Instagram – and they were well worth the wait. What a cutie! Megan Fox also posted a rare, gorgeous photo with son Bodhi. “I will give you roots and I will give you wings,” it says. Hayden Panattiere’s partner, Wladimir Klitschko, also got in on the photo-sharing action, posting to Instagram a picture of the Nashville actress with one-month-old daughter Kaya. And if all that’s not enough celeb baby news to keep you going you, don’t fret – there are plenty more to look forward to this year – Princess Kate, Keira Knightley, Asher Keddie, Liv Tyler, Jessica Biel and Lara Bingle (maybe), to name but a few.